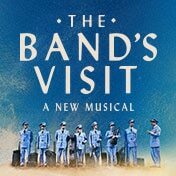 Please Note: There will be an Open Captioned Performance of The Band's Visit on Thursday - February 28 @ 7pm. 3 flights of stairs up 30 steps. Please note, once on the Mezzanine level there are approximately 2 steps per row. Entrance to Mezzanine is behind row E of the Front Mezzanine. In Lobby (Accessible at 54" with utility outlet).